I’m working on a flash book and here I came across a question. I was trying to embed a video to my book, I tried “add movie” option, but it embed the video directly to the page. What I’m trying to do is first to show a preview or screenshot of the video, and click on the preview the video plays. How can I do this? 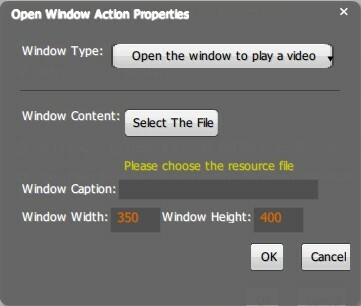 You can add a photo to the page and choose the photo action to open a video. At first you have to create a preview image of the video. And then click “Edit Page” to launch the page editor. The detail about add photo please check here. 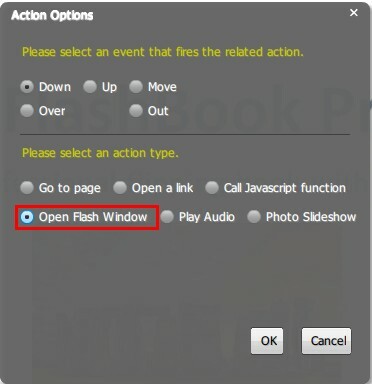 While choosing action options, check the “open flash window” option to popup dialog box. Click “select the file” to choose a video from your computer. Also choose window type if you are adding a SWF file. You can also say something to your readers in the window caption blank.